Sometimes if we are sending messages to our recipient, we realized after that something is missing or wrong in the message that we sent. To avoid embarrassment I will show you in this post how you can change the message that you sent to your recipient. Remember that you can only change the message that you sent if it is not read yet or the outlook is open otherwise you can’t do anything. Follow that step below how to recall or change the message that you sent. Find the message that you sent, go to sent items. Double click the message that you sent, a new window will pop up, click on “Other Actions” in the Action menu, then click the “Recall this message” on the drop-down. See the picture below. 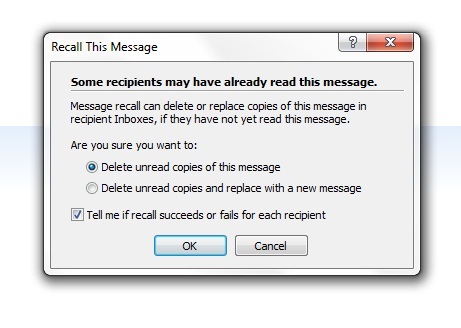 Recall this message window will pop up, there are two options to choose from, First “Delete unread copies of this message” and the second “Delete unread copies and replace with a new message” choose which one you like and to confirm that you succeeded to replace or delete the message that you sent just check the check box “Tell me if recall succeeds or fails for each recipient”. See the picture below. It’s done if you select delete unread copies, if the second option selected you will redirected to a new window wherein you can edit your message and send again, after that just wait the reply message to arrive if you succeed or not.